Scores of Palestinians choked on teargas afternoon Friday after the Israeli occupation forces quelled a weekly march in Qalqilya condemning Israel’s unabated settlement activity. Israeli soldiers attacked marchers as they approached the apartheid wall with heavy barrages of teargas canisters, resulting in several suffocation cases. The occupation forces further chased down marchers in an attempt to detain them. The Hamas official Taher al-Nono, Media adviser to the head of the political bureau of Hamas Ismail Haneyya, said that the Israeli evicting of Palestinian families residing in Bedouin compounds near Occupied Jerusalem, especially in al-Khan al-Ahmar reflects Israel’s practices of terrorism and ethnic cleansing. In a statement on Thursday, Nono hailed the steadfastness of the Palestinian families in al-Khan al-Ahmar area and their adherence to their land and homes. He called for confronting the Israeli plans of emptying the Palestinian lands of its Palestinian residents. Nono also asked the international community and all competent authorities to urgently intervene for halting the Israeli crimes and violations in the region. Former Israeli minister Gideon Sa’ar, widely tipped as a potential successor to Prime Minister Benjamin Netanyahu as leader of the Likud party, reaffirmed his rejection of a two-state solution on Wednesday, suggesting Palestinians in the West Bank could have Jordanian citizenship. Sa’ar made the remarks at an event in Jerusalem organised by the “Israel Victory Project”, an initiative of hard-right US-based think-tank the Middle East Forum. “The two-state solution was nothing more than a two-state slogan, and it was only theoretical,” Sa’ar told the audience, according to a report by Jewish News Syndicate. “He also suggest[ed] that Palestinians living in the West Bank could once again receive national citizenship in Jordan,” the report continued. Israeli forces confiscated metres of water pipes in the Bardalla village in the northern occupied West Bank yesterday morning. 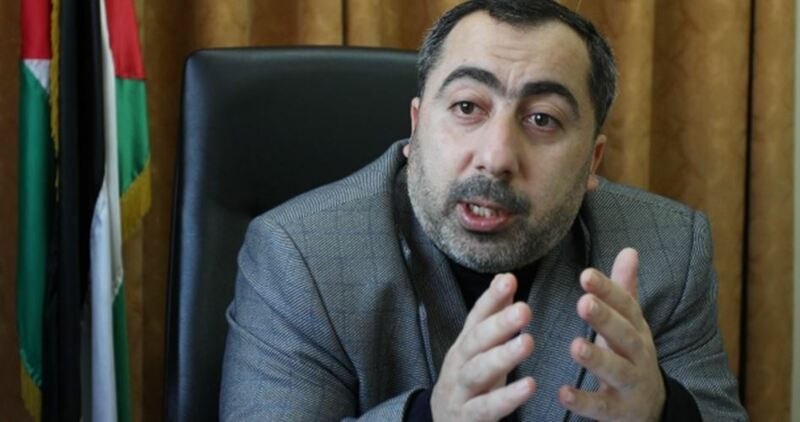 Activist Aaref Daraghmeh said that Israel continues to carry out assaults and violations against residents of Bardalla confiscating and destroying the village’s water sources in an attempt to force its residents out. Israeli forces had demolished a pool used for gathering drinking water in the Jordan Valley on Wednesday. The Jordan Valley forms a third of the occupied West Bank, with 88 per cent of its land is classified as Area C – under full Israeli military control. Socialist International brings together 140 global political parties, including 35 parties in government in South Africa, Argentina, Spain, Colombia, Portugal, Tanzania, Luxemburg, Romania, Iraq and elsewhere. Given its sheer size and global reach, Socialist International’s call for sanctions against Israel is a game-changer in the global BDS movement. It is the most significant call for sanctions against Israel to date since BDS was launched in 2005. BDS activists expect it to blow wind in the sails of the BDS movement and in particular, to mainstream the call for a military embargo on Israel after its massacre of over 130 unarmed protesters in Gaza in May. 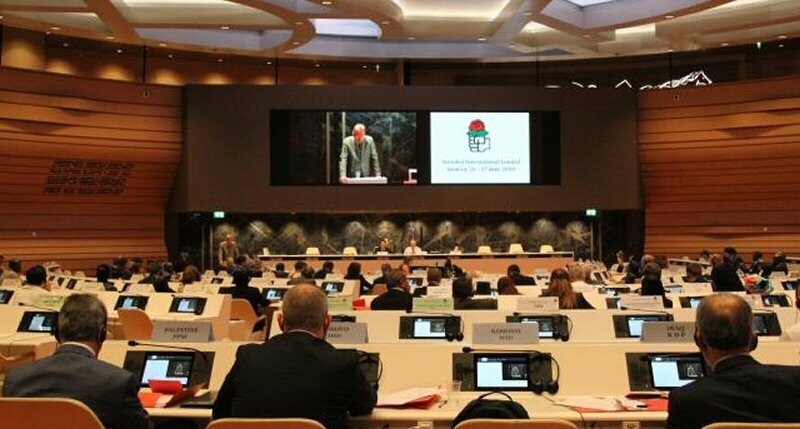 We deeply value Socialist International’s principled solidarity with the people of Palestine and salute them for taking concrete measures to hold Israel accountable for its decades-old regime of military occupation, colonialism and apartheid. We look forward to the implementation of this momentous declaration in SI members’ home countries. The Head of the Commission Against the Israeli Annexation Wall and Colonies, Walid Assaf, said the Israeli High Court’s decision to temporarily halt the demolition of al-Khan al-Ahmar Bedouin Palestinian community, east of Jerusalem, is a positive step forward, but added that the legal and political battle to save the community is approaching, as it is still under the serious threat of demolition and displacement. His statement came after the Palestinians managed to achieve a temporary injunction by the Israeli Supreme Court, giving the army until July 11trh, to respond to a petition by the villagers, who said they were denied construction permits due to unfair policies. Assaf said more and ongoing popular, political, diplomatic and legal struggle is now urgently needed to achieve a ruling completely voiding the Israeli decision to demolish and displace the Palestinian community. During a press conference in al-Khan al-Ahmar village, Assaf said the lawyers of the commission, supported by the steadfastness of the locals, Israeli and international peace activists, managed to achieve this victory, this first step. He added that the temporary injunction gives the legal team some time to study the earlier decision of the High Court thoroughly allowing the demolitions, to prepare for a new defense and find ambiguities in the initial ruling. 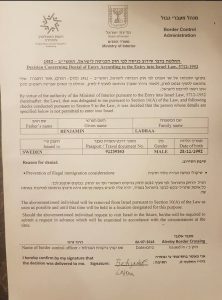 Assaf said that after Civil Administration refused to receive the file, the lawyers rushed to the Israeli High Court, on Thursday evening, demanding an injunction halting the displacement and demolition. The official added that “the Palestinian leadership, all factions, unions and the peace activists managed to foil America’s so-called Deal of the Century on the field level, but the struggle against the displacement of our people in Area C of the occupied West Bank is still ongoing, especially since Israel wants to remove the indigenous Palestinians to control the lands and build colonies. Assaf added that the case of al-Khan al-Ahmar Palestinian village is not only about displacement of the inhabitants, but also part of the ongoing struggle against the Israeli plans to build thousands of colonialist units by displacing dozens of Bedouin communities in the occupied West Bank. Adnan Al-Husseini, a member of the Executive Committee of the Palestine Liberation Organization (PLO), said the Palestinian leadership rejected the so-called ” of the Century,” presented by U.S. President Donald Trump, and added that part of rejecting this plan is the struggle to save al-Khan al-Ahmar. Arab Member of Knesset, Dr. Ahmad Tibi, said the Israeli occupation wants to subject the Palestinians to another Nakba, like what happened to them in 1948, and added that the inhabitants of al-Jahalin Bedouin village, al-Khan al-Ahmar, every community, and every Palestinian will remain steadfast, and will never abandon their legitimate rights. He also said that the delegations and diplomats who visited al-Khan al-Ahmar to protest the Israeli decision had an impact, but what is needed is real policies to oblige Israel to refrain from implementing its illegal projects. 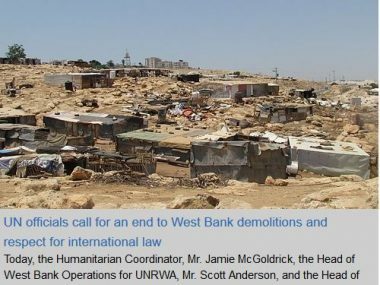 Today (Thursday), the Humanitarian Coordinator, Mr. Jamie McGoldrick, the Head of West Bank Operations for UNRWA, Mr. Scott Anderson, and the Head of the UN Office for the High Commissioner for Human Rights, Mr. James Heenan, expressed serious concern over demolitions and related events in vulnerable Palestinian communities in the central West Bank. 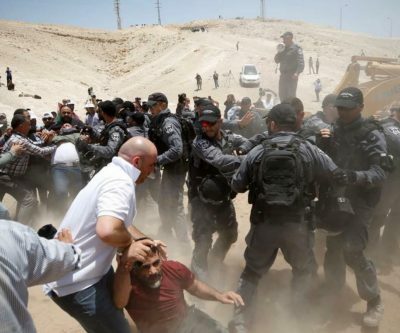 Yesterday, Israeli forces began levelling access routes in the Palestinian Bedouin community of Khan al Ahmar-Abu al Helu, home to more than 180 people, 95 per cent of whom are Palestine refugees. The work comes in advance of the expected demolition of the entire community. Israeli forces injured thirty-five Palestinians and arrested others, including residents, in confrontations that ensued while bulldozers were levelling all entry and exit points. One Israeli soldier was also reported injured as well. Today, the Israeli authorities have declared Khan al Ahmar a closed military area, and are heavily restricting movement of residents and preventing the entry of others to the community. This situation occurs on the backdrop of a wave of demolitions across the West Bank in recent days. Since 1 July, eleven incidents have occurred, displacing 59 Palestinians, including 37 children, and affecting more than 200 others. Included within this is the demolition of 19 structures, including nine homes, in the Palestinian Bedouin community of Abu Nuwar (around 600 residents, 88 per cent Palestine refugees). As a result, 51 people, including 33 children, were displaced and another 13 people, including five children, who had family property destroyed, were directly affected. Also, one home was destroyed today in Susiya, displacing a family of five. For more information, please contact Mr. Ofir Feuerstein, +972 (0) 54 33 11 836, feuerstein@un.org. Khan al Ahmar – Abu al Helu and Abu Nuwar are among the 46 Palestinian Bedouin communities (8,100 people) at risk of forcible transfer in the central West Bank and among the more than 3,500 residents living in 18 communities located in the area slated for the E1 settlement plan that seeks to connect the Ma’ale Adummim settlement bloc with East Jerusalem. International humanitarian law (IHL) requires an occupying power to protect the population of the territory that it occupies, ensure its welfare and wellbeing, as well as the respect for its human rights. Any destruction of property by the occupying power is prohibited, except when rendered absolutely necessary by military operations, which is not relevant in the West Bank where there are currently no active hostilities. The extensive demolition of property, not justified by military necessity and carried out unlawfully and wantonly, may be a grave breach of the Fourth Geneva Convention and may amount to a war crime. Other than for the security of the population or imperative military reasons, IHL further prohibits the transfer of the population of an occupied territory without the genuinely and fully informed consent of the affected people, regardless of the motive. Consent is not considered genuine in an environment marked by the use or threat of physical force, coercion, fear of violence or duress. In the absence of such consent, the transfer is forcible and constitutes a grave breach of the Fourth Geneva Convention. 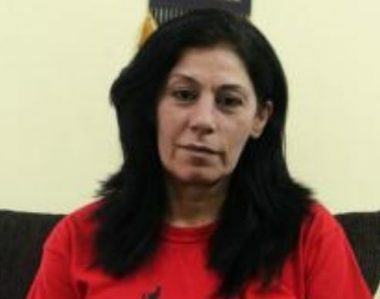 By Ad-Dameer Prisoner Support and Human Rights Association: In a hearing held on 2 July 2018, Military Court Judge Raphael Yemeni confirmed the renewal of Palestinian Legislative Council Member Khalida Jarrar’s administrative detention order. This will be the second time in which it has been renewed, meaning that Khalida has been held without charge or trial since 2 June 2017. Khalida nor her lawyer were present for the hearing, as she is part of the collective action to boycott all court hearings related to the process of administrative detention. According the Judge’s decision, there has been new secret information brought to his attention. This information apparently confirms that Khalida remains a threat to the security of the state. This information apparently confirms past claims made against Khalida though he does not specify if the new information is relating to the current period, or prior to her arrest. On the basis of said secret information, it was concluded that Khalida’s release will cause a security threat to the state. In order to balance the rights of the individual to freedom with the apparent security of the state, Judge Yemeni came to the conclusion that a four month extension was appropriate. The irony of such a statement is that Khalida has now been imprisoned for over a year. 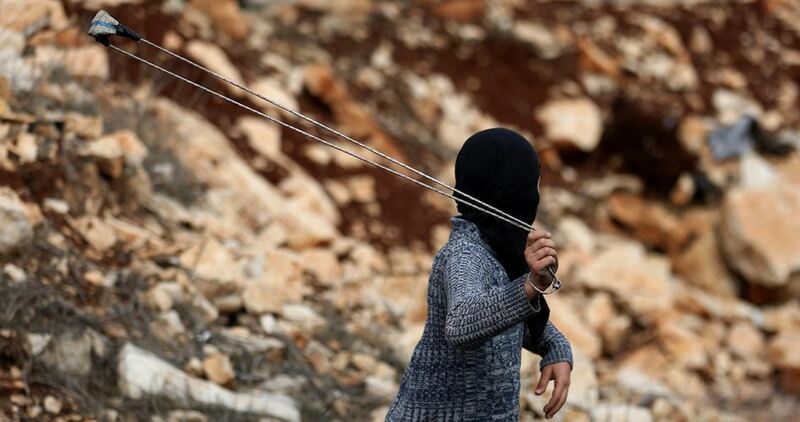 It is difficult to envisage a way in which an additional four months adds to the security of the occupation state, or how her imprisonment affects it in anyway. The Judge’s assertion that he is balancing her right to freedom with the security of the state is especially ludicrous. It rest on the notion that this reduction of the order from the maximum six months, to a more moderate four months without charge or trial, is somehow an act of legal kindness. The process of administrative detention represents the most severe action that an occupying state can utilize against a protected populace under the Fourth Geneva Convention. According to Article 78 of said convention such a process can only be utilized “for imperative reasons of security” for as short a period as possible. In the light of the Judge’s decision, it is difficult to legally rationalize such a high threshold for imprisonment with the occupation’s continued internment of Khalida. As such, Addameer calls for the occupation to meet its obligations under international law and free Khalida along with all of its administrative detainees. For such a process to be legal, a clear indicator of how an individual meets such standard as set out in the Article 78. In addition, we call on all third party states to abide by Article 1 of the First Geneva Convention, and take concrete steps to ensure the occupation abides by humanitarian law more broadly. If you wish to assist to free Khalida, please contact your local representatives and ask them to push the issue with your government. Additionally, you can send contacts to the relevant decision makers in the occupation government. Their details can be found here. 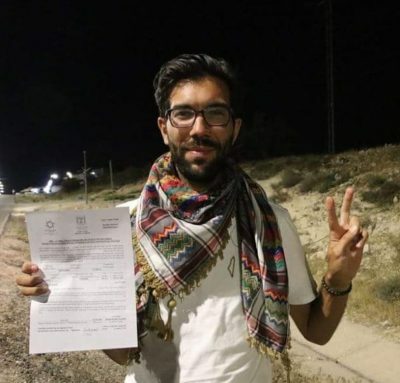 The Israeli Border Authority denied entry to a Swedish peace activist, who started walking to Palestine eleven months ago to raise awareness about the Israeli occupation, and the suffering of the Palestinian people. The peace activist Benjamin Ladra started his walk on August 8th, 2017, with the aim of informing the world about the situation in Palestine and spread awareness about the Israeli military occupation. His walk also marked the centennial of the Balfour Declaration of 1917, in which Britain pledged a Jewish homeland in Palestine during the British mandate and occupation of the country. After being denied entry, he said the officers at the Israeli-controlled crossing with the West Bank interrogated him for six hours, and told him that they believe “he was lying during interrogation,” and that “he would be participating in the protests in Nabi Saleh village,” near Ramallah. The Israelis didn’t allow me to enter Palestine. I was interrogated for about six hours before they told me I was denied entry. They only gave two reasons for denying me entry, one was that they thought I was lying during the interrogation and the other was that they thought I would go to Nabi Saleh and make a demonstration (which they just assumed). On this day it has been eleven months of walking and speaking about the human rights violations under the occupation. Now ask yourself why the Israeli state fears one Swedish man so much that they didn’t allow him to enter the country they are occupying. This is the power of activism. Tomorrow I will make the final distance of my journey and arrive at the border of occupied Palestine. There is a big probability that the occupying Israeli soldiers will not let me enter Palestine so i have a favor to ask of everyone if this happens. My journey has been about raising awareness about the human rights abuses committed under occupation and the media is a very powerful tool for spreading awareness. If they don’t let me in tomorrow it is a very good opportunity to try and get the media around the world to talk about how Israel is blocking human rights activists from entering Palestine. So, I need everyone to contact as many newspapers, TV stations, News Agencies etc. as possible and share this story. What I did on my walk was to Google ‘country name + media’ and try to find a phone number or email to all the media outlets in all the countries I was walking through. So please be ready on Thursday evening and Friday to see if they didn’t let me in and let the world know that they are hiding their crimes by not allowing people that would bear witness. The UN Security Council once again failed to stop the carnage civilians in Syria, particularly in Dara’a province by the Assad regime forces and their allies. Vice-President of the Syrian Coalition, Badr Jamous, said that the indifference being shown by the international community towards the tragedy of the Syrian people would remain a dark stain on humanity’s conscience. An emergency session of the Security Council on the situation in Syria’s south ended Thursday evening without any results. The session was held in parallel with relentless Russian airstrikes on the town of Saida in eastern rural Dara’a resulting in the death of a family of a mother and four children. Jamous called upon the United Nations to hold Russia, Iran and the Assad regime responsible for the war crimes against Syrian civilians as he stressed the need to activate the international neutral mechanism to hold war criminals accountable. During the UN Security Council meeting, which was convened at a request by Sewden, UN Secretary-General Antonio Guterres expressed his deep concern at the devastating impact of the military campaign being launched by Assad forces and the Iranian terrorist militias with Russian aerial support in southern Syria. UN Spokesman Stéphane Dujarric on Thursday said that an estimated 750,000 lives in southern Syria are in danger, adding that more than 320,000 people are now displaced and most are living in dire and insecure conditions. Jamous condemned all crimes taking place against civilians in Dara’a, stressing that the regime’s onslaught on the province is part of the demographic change and mass forced displacement policy it has pursued elsewhere in Syria. He pointed that the regime’s strategy is aimed at disrupting political solution in Syria.